PCE offers a wide selection of high-quality pallet scales which come up to strict European industrial standards. We sell our own PCE pallet scales but also resell highly recommendable pallet scales of other established producers at favourable prices. With our class III pallet scales you will be able to weigh loads directly in the loading ramp. Using pallet scales is not only very convenient and time saving but also shortens the path you have to go with full pallets. Even the number of employees necessary to work with pallets is reduced. Our pallet scales are very useful in various industrial environments like transport and logistics and many more. We have two models of pallet scales: pallet scales to cross over the loads and scales which are brought into the load (U size). The terminals of our pallet scales can be positioned in many different places: on the table, installed to a wall or on a tripod next to the scales. The data can easily be viewed on a display which is also included in the delivery content of many of our pallet scales. Multiple price ranges, accuracies, resolutions, response times, dimensions, materials and measurement ranges are available so that you can find the pallet scales that perfectly suit your needs. Most pallet scales are equipped with an RS232 interface. At PCE, you will even find pallet scales that can weigh excessively long or oversized goods easily. Many of them have additional functions like a max. and min. function, a counting function, a percentage function, an averaging function, a sum up function, an integrated printer or a memory function. Some types of pallet scales can be calibrated or officially verified upon request, for instance scales to weigh Euro pallets. There are also many pallet scales available which fulfil IP protection classes. One advantage that all of our pallet scales have in common is that they are all very robust and thus are very suitable for use under tough industrial conditions. For energy saving reasons, some of our pallet scales are equipped with an automatic power off function. Installation plans are necessary for some models of pallet scales, in which case it is recommended to read installation plans and make the necessary arrangements for preparing the place of operation before delivery. Installation plans can be sent upon request. All of our pallet scales include a user manual which assists you in using the scales properly and on a long-term basis and in most cases rechargeable batteries and a charger. 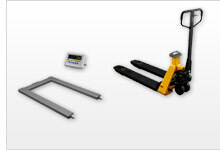 We also offer lots of useful optional accessories along with our wide range of pallet scales, such as ramps or tripods. PCE-SW 1500N is a portable industrial scale or industrial pallet scale featuring two heavy-duty parallel weighing beams made of lacquered steel that can be positioned up to 4 m / 13 ft apart. Thus, the adjustable width accommodates multiple pallet, box and container sizes. In addition, the battery-powered industrial scale's stainless-steel-encased display can be placed up to 5 m / 16 ft away from the weighing beams, allowing for wall mounting. This Pallet Scales PCE-EP 1500 allows you load directly in the ramp in no time at all. This model of Pallet Scales is the ideal solution for fast and precise mobile weighing in industrial and warehousing applications, in shipping and receiving applications and in inventory control. Now, you don't need to move with big efforts the pallet up to the scales. PCE-SW 3000N is a portable battery-powered industrial pallet scale or floor scale featuring two heavy-duty parallel weighing beams made of lacquered steel that can be positioned up to 4 m / 13 ft apart. Thus, the adjustable width accommodates multiple pallet, box and container sizes. In addition, the scale's stainless-steel-encased display can be placed up to 5 m / 16 ft away from the weighing beams, allowing for wall mounting. PCE-PTS 1N is a heavy-duty, hand pallet truck, pallet jack, warehouse, dock or floor scale used to weigh industrial shipments up to 2000 kg / 4409 lbs / 2.2 Tons. Save precious time by weighing your pallets of merchandise right on the pallet jack. Eliminate the use of a forklift to carry pallets of items to a separate scale for weighing. Weigh your goods right at the dock during loading or unloading. PCE-SW 5000N is a portable battery-powered industrial pallet scale or floor scale featuring two heavy-duty parallel weighing beams made of lacquered steel that can be positioned up to 4 m / 13 ft apart. Thus, the adjustable width accommodates multiple pallet, box and container sizes. In addition, the scale's stainless-steel-encased display can be placed up to 4 m / 13 ft away from the weighing beams, allowing for wall mounting. The pallet scales are calibratable, and also initially calibrated, designed for mobile applications and having a U-shaped design. The size and measurements of the calibrated pallet scales PCE-SD U series are accordant to European standard pallet scales (1200 x 800 mm). The U-shape of the calibrated pallet scales allows easy positioning of EU standard pallets on the scales, preferably with a forklift. The U-shaped pallet scales are calibratable scales that will be already calibrated before delivery. The measurements of the U-shaped pallet scales are exactly accordant to serial EU palettes. The U-shape of the pallet scales allows quick and easy loading of the scales even by means of forklift scales. The four load cells of the U-shaped pallet scales are IP68 protected and are embedded at the corners of the U-shaped scales. The PCE-TPWLKM Pallet Scales are verified forklift that integrates a scale of two ranges. It is verified by Trade Class M III, with a weight range up to 2000 kg. The Pallet Scales have a resolution of 0.5 kg to 1000 kg and between 1000 kg and 2000 kg a resolution of 1kg. The accuracy of the Pallet Scales is very high, as the tolerance value is 0.1% of the weighed value. This accuracy is confirmed by the verification. The Pallet Scales have a high contrast LCD display, with 25 mm digits, and it is integrated in a stainless steel housing with IP 68.